Sithonia (Greek: Σιθωνία), also known as Longos, is a peninsula of Chalkidiki, which itself is located on a larger peninsula within Greece. The Kassandra Peninsula lies to the west of Sithonia and the Mount Athos peninsula to the east. Sithonia is also a municipality, covering the Sithonia peninsula. The seat of the municipality is the town Nikiti. 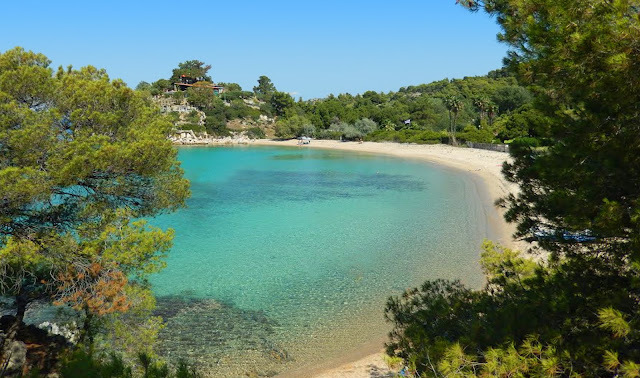 Spathies Beach is typical of the beaches in this region, with crystal clear waters and pine trees that come down almost to the water. The beach is about 44 km southeast of Polygyros and south of Nikiti. The waters of Greece look so lovely!